Cyprus, the largest island in the Eastern Mediterranean, is a very curious place. There can be few islands in the world that are administered by three different nationalities, or which have such a convoluted political history. 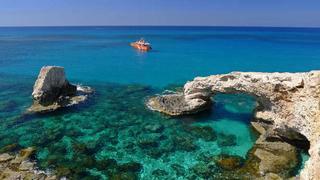 But despite the confusing nature of Cyprus, it is a beautiful and interesting destination for a charter holiday. Measuring 140 miles by 50 miles, Cyprus is similar to many other large Mediterranean islands in that the coastal strips are generally built up with tourist facilities, while the interior of the island retains a more traditional feel. Cyprus is no exception, and many of the best beaches are overrun with package tourists, but there are also some delightful bits of coastline that have been protected from over-development. The history of Cyprus has dictated the rather strange political landscape. Cyprus won independence from Britain in 1960, but tension between Greek and Turkish Cypriot communities led the Greeks to overthrow the Cypriot government and attempt to unify the island with Greece in 1974. In response, Turkey invaded to protect the interests of the Turkish Cypriots, and a short war ensued before the UN established a ceasefire and set up the “Green Line” which separates northern (Turkish) Cyprus from southern (Greek) Cyprus. For almost a decade it was very difficult to cross the Green Line, but since the mid-eighties there has been free movement in both directions. To make matters more complicated, Britain has retained several areas as British Overseas Territory, administered as a Sovereign Base Area. These are used as strategic military bases for operations in the Middle East. Despite all these shenanigans, the island is peaceful and attracts millions of visitors every year, thanks to its fabulous climate, it interesting history, and its cultural heritage. Facilities on the island for superyachts are surprisingly good, and the island is suitable for a week-long charter.